Content restriction works a bit differently for WordPress Pages vs Posts. The following article describes the differences and how to configure your WordPress membership site to control access to your premium content. Posts: Content restriction works differently for Pages and Posts. Posts are removed from the site altogether for visitors who do not have access to them. Post categories are also dynamically removed from the Category sidebar widget based on what categories the visitor may access. The reason for this behavior is that many posts could potentially show up in various archive views, like on a blog, which could result in a large number of posts with access denied messages. This would clutter up the view and be a hassle to actually find posts your were allowed to view. Therefore, posts are simply removed for the visitor. If a restricted post is directly accessed and the visitor does not have permission to view the post, the page returns 404 (page not found) error. Pages: There are multiple settings for controlling what happens when a visitor attempts to access a page which they are not allowed to see. 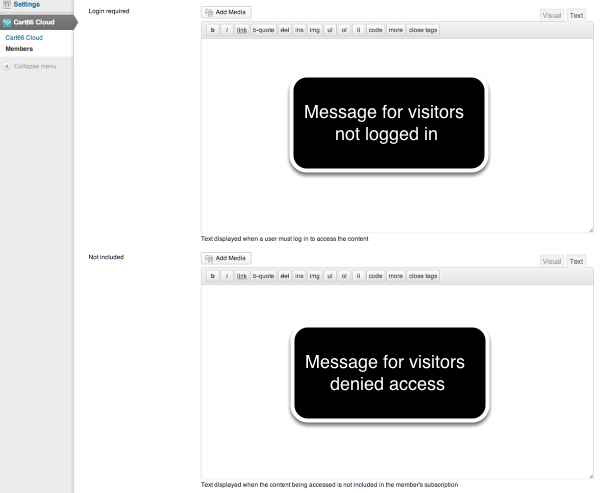 On a global level, you can define a custom message to be shown if the visitor is not logged in and another message to be shown if they are logged in but do not have access to the particular page they are trying to visit. In addition, on a page-by-page basis you can define a specific access denied page where a visitor will be redirected if they attempt to access a page that they do not have permission to see. 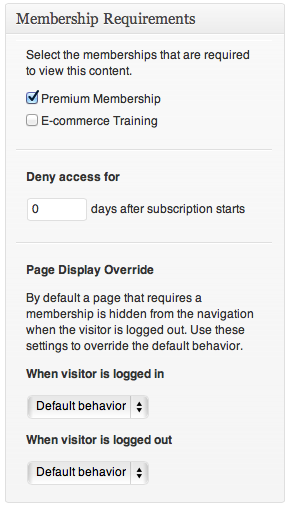 The access denied page is set for pages only using the Membership Requirements meta box on the page editor. Simply select the page on your site that you want to use as the access denied page for the page you are editing and then save the page.